The resulting master plan clusters the buildings around a large central plaza, facing the High Street Road. This provides the opportunity for both increased on-site parking during service times, and a large outdoor event space. As Melbourne’s largest church CityLife Church has a growing congregation and an ever increasing demand for its community services. 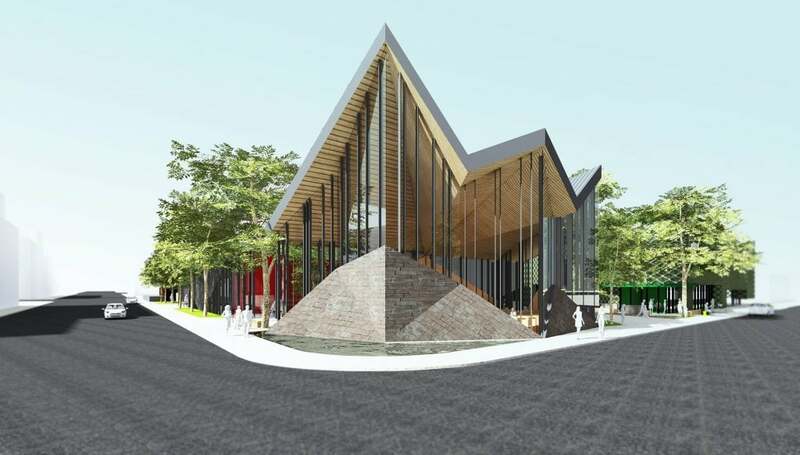 DKO was commissioned to master plan an expanding campus to accommodate a new foyer for their auditorium building and a new Community centre for the community services organisation, CityLife Community Care. The resulting master plan clusters the buildings around a large central plaza, facing the High Street Road. This provides the opportunity for both increased on-site parking during service times, and a large outdoor event space. For the new auditorium foyer DKO designed a large, highly visible two-level structure with a clear glazed and transparent ground floor that opens views to the street and to the community. This design responds to the brief that sought a building that is equally open and inviting to the public. The building’s first floor volume cantilevers to provide shelter and sun-shading for the ground floor. Large apertures in the form frame key vistas out of the building, while a two-level ‘activity street’ functions as a circulation axis from which all rooms are accessed. A café and visitor lounge areas were located within this circulation space, allowing the activity street to become a vibrant social space where chance meetings are encouraged and new relationships can be fostered.